Tis the season for pie! 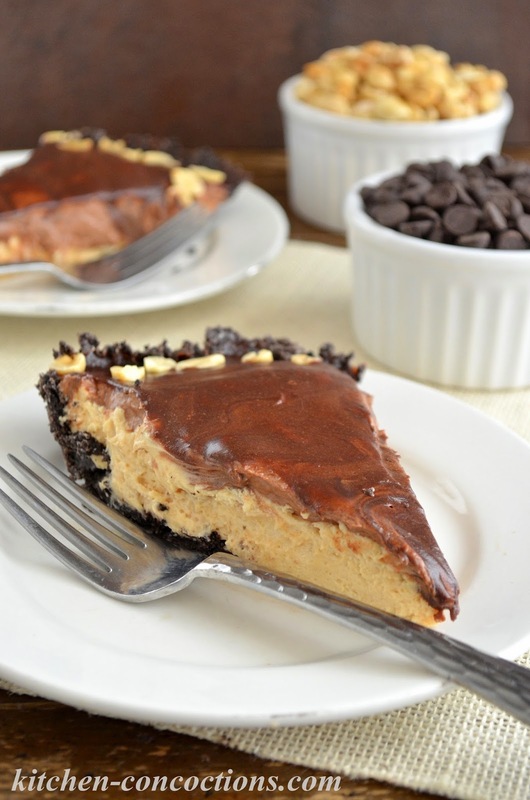 Wow your friends and family with this Chocolate Peanut Butter Mousse Pie! The rich and creamy homemade chocolate and peanut butter mousse is layered into a crispy chocolate cookie crust and is then topped with a delicious chocolate sauce and salted peanuts! A few weeks ago I rambled on and on about my Mom’s incredible pie making skills. To say that her pies were pretty much the only thing I was looking forward to at Thanksgiving dinner would be a complete understatement! All I could dream about for weeks and weeks leading up to Thanksgiving were all the glorious pies my Mom would be bringing. And pies she brought! Blueberry. Pecan. Pumpkin. Cherry. Chocolate. My Mom’s blueberry pie is hands down my favorite! Followed closely by her pecan and this Chocolate Bar Pie. Every little bit of that Blueberry Pie was simply delightful and if I am being honest (we are all friends right? ), I am totally regretting I didn’t go back for seconds. In that same blog post that I annoyingly rambled on about my Mom’s pies, I shared that while I absolutely love pie, I am still mastering my pie making skills. Today’s recipe is complete evidence that patience is a must (and something I lack) when it comes to pie making. You see, there are several layers to this pie and to ensure the layers don’t blend together, the pie must be well chilled before adding the next layer. Not that the pie is hard to make, it is just a bit of a waiting game to get a final finished pie! Read: It is best to make this pie when you have time, at least the day before you plan on serving it. NOT just a few hours before your dinner guests plan to arrive… like I did. 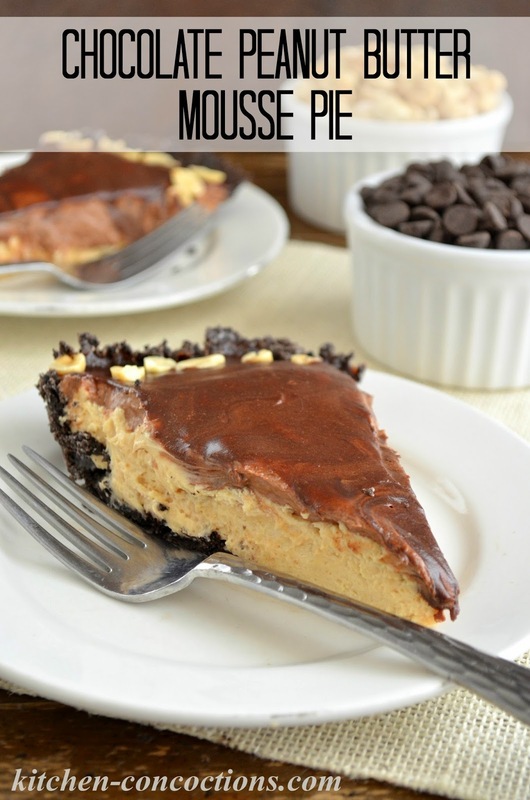 And while this didn’t affect the taste (of course this pie was delicious and is perfect for all my fellow chocolate peanut butter lovers!! ), the appearance on the other hand (with all my layers kind of mixing all together), whelp, is definitely NOT pie ninja worthy. This pie totally has Christmas written all over it and if you take your time (read: do as I say not as I do, er, did!) then you will have a Christmas dinner showstopper that your friends will be thanking you for! 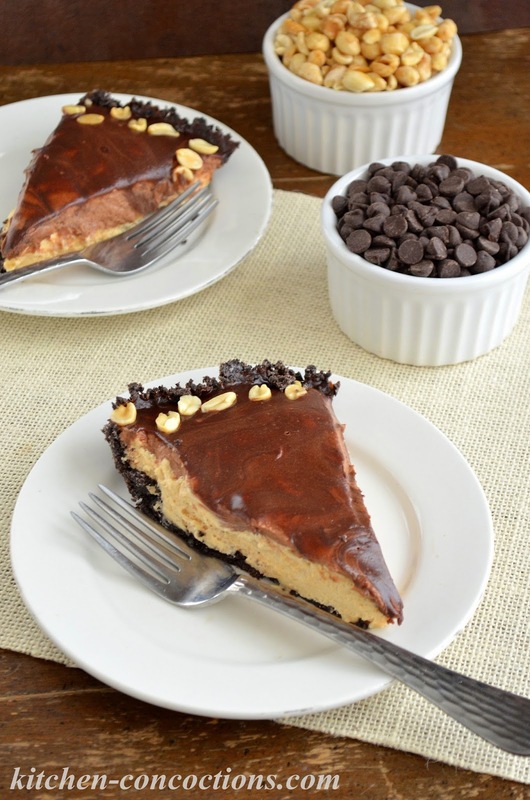 A rich and creamy chocolate peanut butter mousse pie with a chocolate sauce topping and a chocolate cookie crust. To Make Chocolate Cookie Crust: Place cookies in food processor and blend until fine cookie crumbs are formed. Alternatively, cookies can be place in a plastic zip-top bag. Seal bag, releasing excess air, and mash cookies with a meat mallet or rolling pin. Transfer crushed cookies to a medium bowl. Stir together cookie crumbs and melted butter, stirring until well combined. Pat the mixture into the bottom and up the sides of a 9-inch deep dish pie plate. Refrigerate the crust, for at least 15 minutes, while making the peanut butter mousse. To Make Peanut Butter Mousse: In a large bowl using an electric mixer, beat the cream cheese, butter and peanut butter at medium speed until creamy, about 2-3 minutes. Add the milk and mix well. Slowly beat in the powdered sugar, a little at a time, mixing until well blended. Set aside. In a large clean bowl, beat the heavy cream with an electric mixer at high speed until soft peaks form. Using a rubber spatula, gently fold 1/2 cup of the whipped cream into the peanut butter mixture until almost blended. Fold in an additional 3/4 cup of the whipped cream until completely blended and no white streaks appear. Cover the remaining whipped cream and refrigerate until ready to use. Pour peanut butter mousse into the prepared pie crust and spread into an even layer. Cover pie with foil and refrigerate pie for at least 2 hours before adding chocolate mousse layer. To Make Chocolate Mousse: Meanwhile, place chocolate chips in the bowl of a food processor and process until finely ground. In a small saucepan, combine the milk and sugar and bring to a boil over medium heat, stirring frequently until sugar dissolves. With the food processor running, pour the hot milk through the feed tube, and process until the chocolate is completely melted. Scrape down the sides of the bowl, and process again until well blended. Pour the mixture into a medium sized bowl and let cool to room temperature, about 10 minutes. Using a rubber spatula, gently fold 1/2 cup of the reserved whipped cream into the cooled chocolate mixture until almost blended. Fold in an additional 3/4 cup of the whipped cream until completely blended and no white streaks appear. Pour chocolate mousse onto the peanut butter mousse and spread into an even layer. 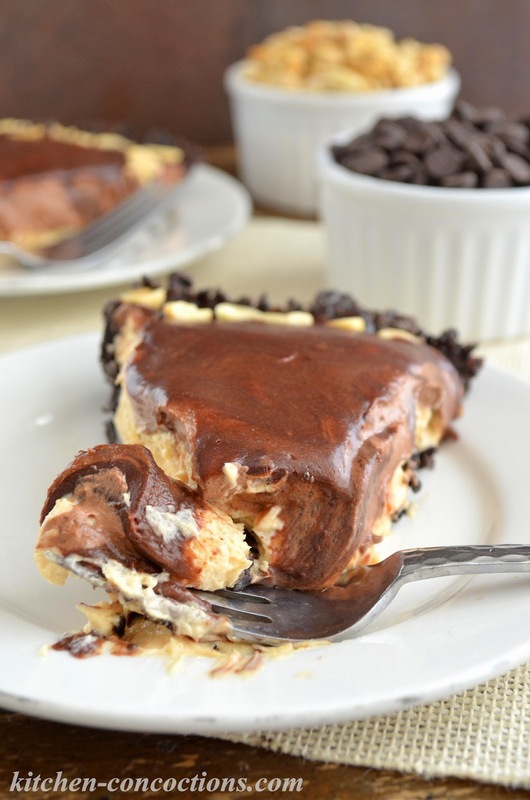 Cover pie with foil and refrigerate pie for at least 2 hours before adding chocolate sauce layer. To Make Chocolate Glaze: Place chocolate chips in a medium-sized heat proof bowl. In a small saucepan, bring the cream to a boil. Pour hot cream over the chocolate and let sit for 2-3 minutes. Gently stir until the chocolate is completely melted and the glaze is smooth. Do not over mix. Allow chocolate glaze cool to room temperature, for about 15-20 minutes, before using. Pour the cooled glaze over the chilled chocolate mousse layer. Using a small metal spatula, carefully spread the glaze evenly over the top of the pie. Before the glaze sets, sprinkle top of pie with peanuts. Chill the pie for at least 4-6 hours, or overnight, before serving. Store leftover pie, covered, for up to 3 days in the refrigerator. Recipe Note: To keep your pie layers from mixing, it is very important to refrigerate the pie for at least the full length of time indicated in the directions.